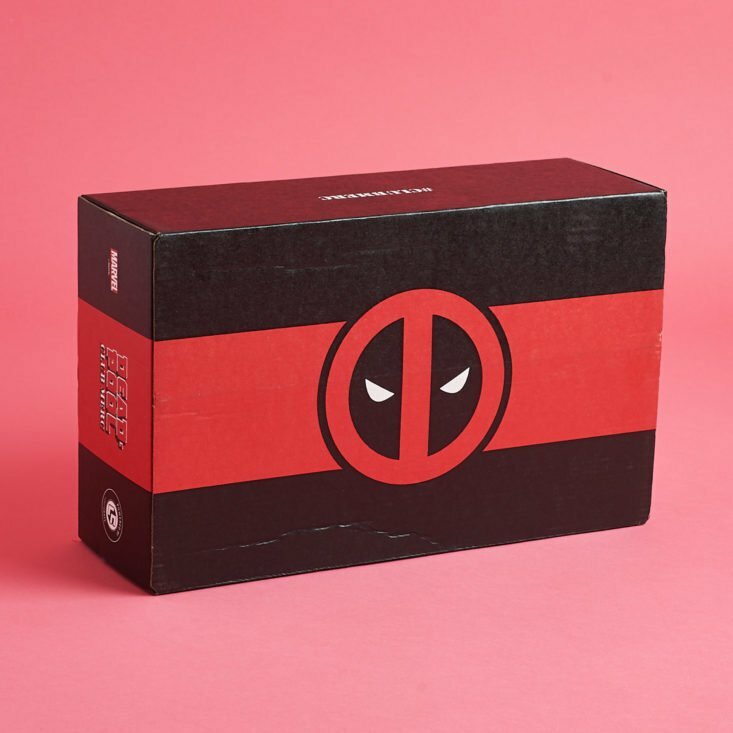 Deadpool Club Merc Crate is the latest box from Loot Crate. It’s a quarterly box that delivers all-thing Deadpool – including official and original collectibles and gear. The second crate featured a shirt, pin, some writing utensils, and one awesome print. The other side is an 8×10 worth displaying – this features the cover art from Deadpool #50. Deadpool Knifed Pin – Value $5-10? Loot Crates almost always have an enamel pin, as well. This month’s pin is inspired by Cable & Deadpool #49. Deadpool Turnaround T-Shirt – Value $15? This month’s shirt features artwork from Spider-Man/Deadpool #2 – it features a stylish look at Deadpool’s fashion choices. Deadpool Sketchbook – Value $10? Let’s start the writing utensils section off with this Deadpool sketchbook. It features some sketched artwork in the front along with some small pages for doodling – plus a Deadpool logo page-saver. Deadpool Dialogue Pencil Set – Value $5? To get your doodling started – you’ll get four pencils, each with some Deadpool dialogue. Deadpool Pencil Sharpener – Value $10-15? So, you have a notebook, you have pencils, now you need to sharpen those pencils – what better way to do it than with Deadpool himself. Pop your pencil in Deadpool’s head – because why not!? – to sharpener your pencil. The bottom pops off to toss away your shavings, too. Deadpool Corps Art Print – Value $15? The final item for regular subscribers is this limited edition print of Deadpool Corps #1. It’s an 8×12 and super high quality – worthy of framing for sure. For annual subscribers, you’ll find a little extra in the second box – it’s the annual subscriber limited edition challenge coin for those coin collectors out there. Verdict: This one was alright for me – I liked the majority of items, but nothing really blew me away here. I’d love to see some figures with this line – Deadpool is the perfect character for figures, so I’m hoping to see that in future boxes. What did you thinkof the second crate? Can you still get this box if you sign up today? No, You’ll see the current them on the landing page – the current theme cutoff is December 15th. Check out all of my Deadpool Club Merc Crate reviews to get more information on this subscription. Check out all of our Geeky Subscription Boxes in the Subscription Box List. Rate, review, and follow this subscription on the Deadpool Club Merc Crate profile page. What did you think of the Fall 2018 ‘Stay Sharp’ Deadpool Club Merc Crate? 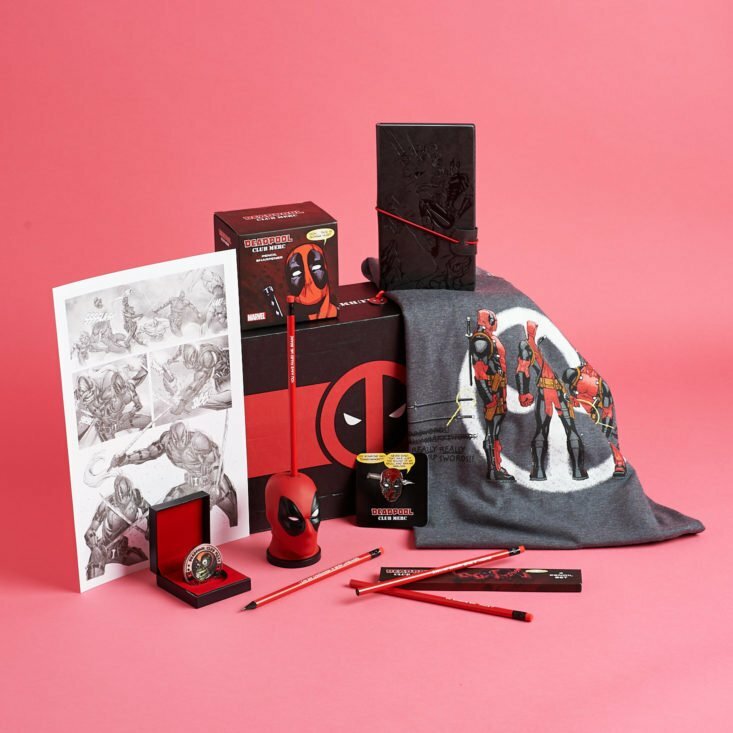 How do subscribers rate Deadpool Club Merc Crate? Do you subscribe to Deadpool Club Merc Crate? Add your rating now!